The new DuPont™ Tyvek® Xtreme W50 Cargo Cover comprises a strong, continuous-filament, fibrous insulation layer laminated to a tough overlay of non-wovenTyvek® material. By combining a low-emissivity silver layer with both a highly reflective outer surface and a high efficiency inner insulation layer, the new cover performs both as a radiant shield and a conduction barrier. The special insulative fleece used in DuPont™ Tyvek® Xtreme W50 is durable and better able to maintain its thermal properties and withstand physical manhandling than plastic film and bubble-based alternatives. Plastic membranes and air pockets can be prone to puncture, tearing and abrasion damage during punishing multi-modal transit steps and this damage may compromise their thermal performance. 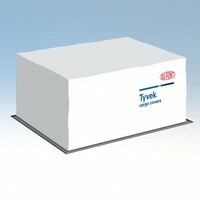 Like all DuPont™ Tyvek® Cargo Covers, the new DuPont™ Tyvek® Xtreme W50 is engineered to be vapour permeable yet fully weather-resistant allowing protected pallets to evacuate condensation by 'breathing' whilst, at the same time, providing dependable protection from rain, snow and wind.